I try not to live the ‘what if’. What if people don’t like what I say or what I write? I have to address this underlying issue―stop “chiding” my voice. As I wrote last week, I love the silence of snow, a frozen landscape outside my window. Winter saps my physical, but not my psychic energy. I was challenged to write a story with the theme “a fork in the road.” The challenge: keep it at 350 words or less. The exercise, I suppose, proved fruitful although, like flash fiction, I find it somewhat tedious. One word building on another with concise economy just like my days as a journalist. Cut the extraneous. It's about two women; there's a bite to the story. Nothing feel-good about the takeaway. I wrote it sitting in my favorite living room chair with Lily by my side. If it’s not published, there are other avenues: rework it, put it in a larger framework. 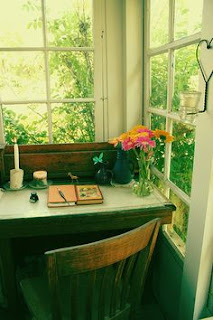 In the Women’s Writing Circle, we create a safe writing space ... a communion of the written word … a leap of faith. We shut out the distractions of the outside world, the disturbances from those who might undervalue the creative process, or choose to ignore it. (You know who they are.) We light the candle and call in the writing muse. 5 a.m. stolen writing time at the kitchen table. A five-minute free write to flex our writing muscles. Think in scenes. Try not to map the whole thing out at once. "My challenge," one woman said, "is quieting my mind." Stay focused … not easy with the rapid-fire (and often meaningless) words we spend time posting on Facebook, Twitter. A room with a view of English countryside sparked Virginia Woolf's creative muse. For J.K. Rowling, a coffee shop humming with voices and activity helped bring Harry Potter to life. Sometimes, a 'nontraditional' creative writing space/time serves a purpose. Take cooking, for example. Preparing and making dinner offers time to jot down thoughts, stir the pot, jot more thoughts. 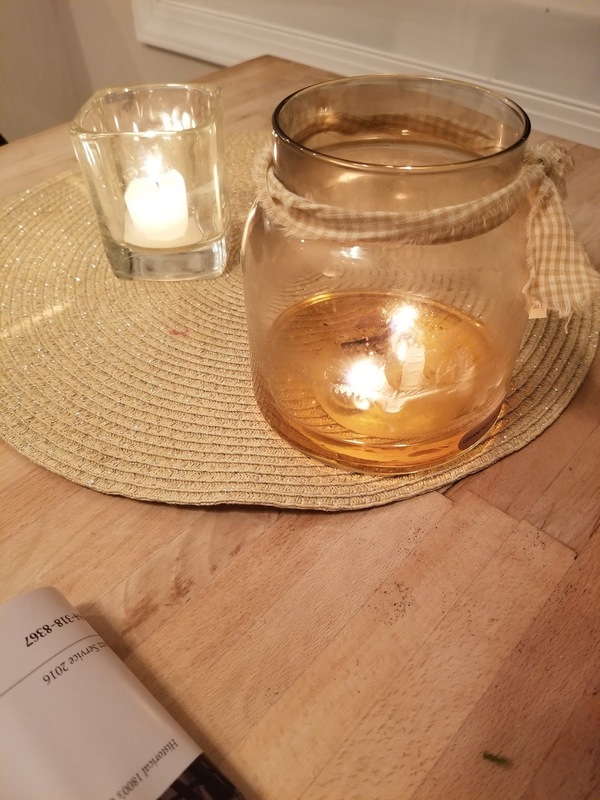 When I cook, I keep the laptop on the kitchen table, a candle burning; after dinner, a notepad and pen on the coffee table near the television. Twinkle lights in a writing space create ‘hygge’, the Scandinavian word for coziness and well-being. 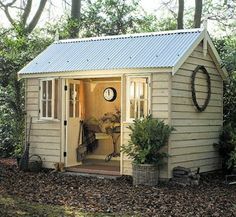 Convert an outdoor shed and create an artist’s studio/craft room. Isn't this one adorable? Haha! You'd better be handy. Find a comfortable chair. Sit down. Take a deep breath. Forgo the 'what ifs' in your safe space. How about you? Can you share your writing space?